The IAADFS Duty Free show of the Americas, 26-29 March will see the launch of two new travel-retail exclusives from the portfolio of Halewood Wine and Spirits. Whitley Neill London Dry Gin and The Pogues Irish Whiskey are both introducing travel retail exclusive one litre bottles. Whitley Neill (ABV 43%) is handcrafted in a traditional copper pot still. Whitley Neill has benefitted from the premium gin category boom, as it has spread across European markets. Alongside this will be a new arrival in the Irish whiskey category. Created by the artisanal West Cork Distillers in association with the Celtic punk band from which it takes its name, The Pogues Irish Whiskey is a blend combining Irish maltand grain whiskies. 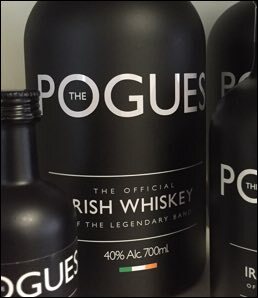 The Pogues (ABV 40%) is made from barley from southern Ireland and Irish spring water. Triple-distilled and non chill-filtered, it is matured in American bourbon barrels before bottling for travel retail in black one-litre bottles.